Latest forecast for Tuesday's and Wednesday's nor'easters, as of Monday evening. Two different (but connected) storm systems. Two sets of impacts. Tuesday’s weather looks tamer than Wednesday’s. But no matter where you live, be prepared for a very busy and very wintry 48-hour period of weather. I’m not going to regurgitate the “Model Madness” game we’ve been playing since last week. Nor am I going to drone on about how this is a low confidence forecast. 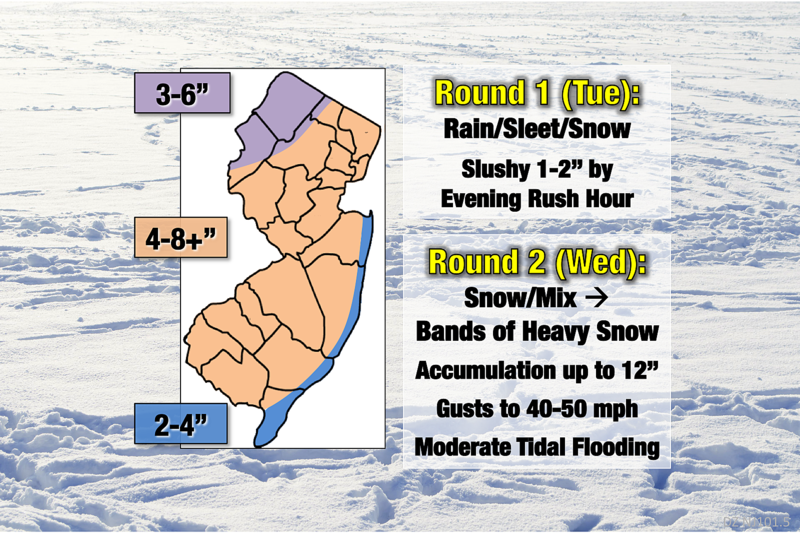 On Monday afternoon, forecast models converged to put New Jersey in the “sweet spot” of snow accumulation. That’s the cue I was waiting for, to bump snow totals both upward and northward. Initial snow showers will drift into South Jersey between Midnight and daybreak Tuesday morning. As the sun rises, we’ll see a complicated mixture of all snow (mainly north of I-195), all rain (along the immediate coast), and wintry mix (along the I-295 corridor). With air temperatures approaching 40 degrees, soil temperatures above freezing, and the high Vernal Equinox sun angle, it’s going to be very difficult for the snow to stick immediately. That will be especially true for paved surfaces treated with salt/brine. Precipitation should be light through the morning hours, potentially becoming a bit heavier (and snowier) through Tuesday afternoon. I think most of the state could see a slushy inch or two by the evening commute — especially in the Winter Weather Advisory area of SW NJ. Current advisories from the National Weather Service, as of Monday evening. Teal=Winter Storm Watch, Purple=Winter Weather Advisory. Again, two separate storms. So Tuesday night through early Wednesday morning, we’ll find ourselves in between the two. I think we’ll still see scattered snow showers as low #1 moves away and low #2 approaches from the southwest. Unless a heavier snow squall sets up, travel conditions should fare OK through early Wednesday morning. The track of storm system #2 is much more “nor’easter-ish”, which could lead to some very heavy snow bands passing through New Jersey. 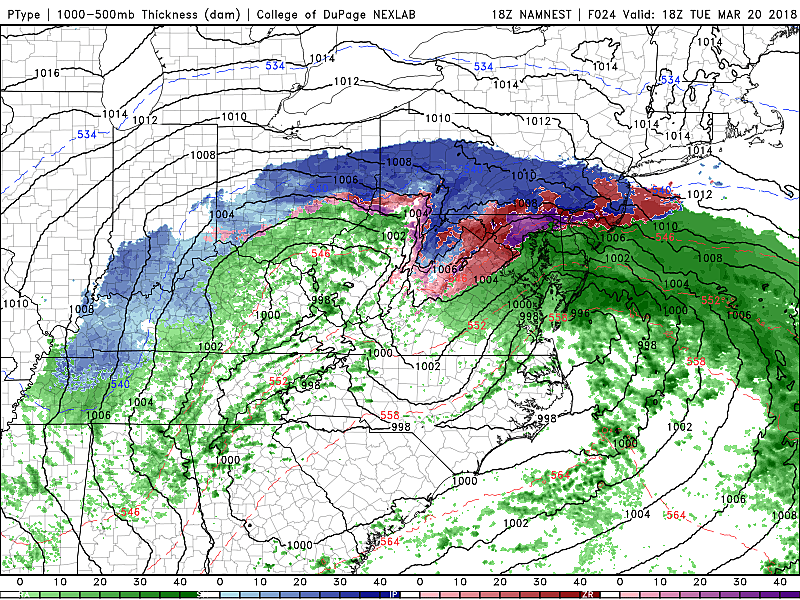 There’s little doubt in my mind now that we’re going to see a “hit” from this second Wednesday storm. But just how much snow will fall and accumulate, and exactly who gets hit the hardest? Still very much up in the air. I raised my top snow contour to 4 to 8+ inches in my latest update. That “plus” could be as high as 10” or even 12” — and that’s some significant, travel-inhibiting snowfall. My latest snow forecast puts lower totals in NW NJ — even though the higher elevations will be cold enough to sustain all snow, that area of the state should fall out of the heaviest snow bands. On the flip side, thanks to the influence of our 41-degree ocean, snow totals along the Jersey Shore should be mitigated as well. Once again, the combination of heavy, wet snow and ferocious winds will likely lead to scattered power outages across the Garden State. Winds will peak on Wednesday, with gusts to 40+ mph across interior NJ and 50+ mph along the coast. The surge picture has unfortunately gotten worse, with new estimates as high as 4 feet. The orientation of the two storm systems will provide an extended period of strong on-shore flow — those classic northeasterly (nor’east) winds. That’s going to push a lot of water toward the Jersey Shore. In fact, the forecast water levels for this storm are the highest of all the coastal storms so far this month. By Tuesday evening’s high tide cycle, we’ll see widespread minor flooding — that’s where road closures in “the usual spots” become likely. 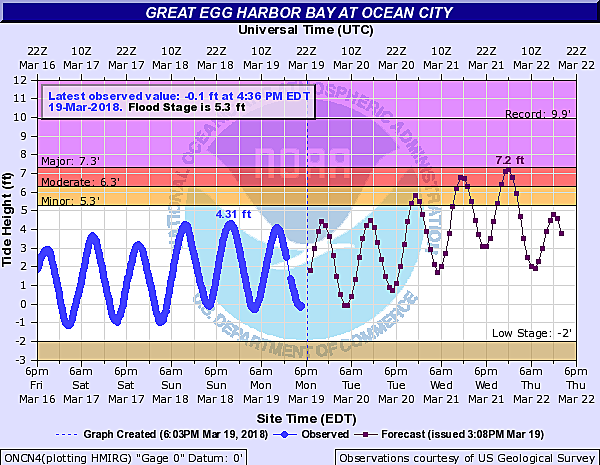 For both high tides on Wednesday, moderate flooding is expected — that’s where the flooding of vulnerable low-lying areas becomes more susceptible to water inundation issues,. A few tide gauges are reading just a few inches shy of the major flood stage for Wednesday night’s high tide tood — that’s when property damage becomes a real concern. If the forecast continues to trend in this snowy direction, I expect quite a few school closures on Wednesday. (A Winter Storm Warning from the National Weather Service would be a pretty good trigger to close.) If the big snow totals verify (and/or power outages and coastal flooding recur), we’ll probably see delays and closings on Thursday too. All around, it’s time to take this double-dealing storm seriously. Go ahead and hit the store for your bread and milk — if the worst-case scenario happens, and these storms overperform my forecast, it’s going to take a while to plow and dig out.